I get to eat a lot of cake at my job. People just bring them in all the time. It’s kind of weird because they always put them out around 8 am. Never in my life have I eaten so bad so early in the morning. I think a lot of people don’t actually want to eat that kind of stuff so early but they know if they don’t grab it now… it will all be gone by the time they would actually want some. The cake is a lie Biff! The cake is a lie! I like how the last two dessert-based comics have Biff standing in the exact same spot. Is that the dessert space in the kitchen? Biff, I like the way you think. Is this a dessert-themed week? If so, I like it. –reaches for more dessert– Yum! Dessert Week on The Book of Biff. So where’s the belt now? You just keep on trying ’til you run out of cake. I noticed that too Tuldas! XD Perhaps it’s a pose that Biff makes in front of meals so frequently that it has become a habit for him. It’s good to see that Biff is still alive. I wouldn’t of thought Biff needed to diet……..I want those cutting skills!! That is amazing. Nobody else would have thought of that. Only Biff. That guy’s smart, he should be working for NASA – I don’t know why he’s sitting around eating cake. ha ha. brilliant. BTW, kudos to all the Portal references. I work night shift at a grocery store, so we’re lucky in that we get to eat all the mistakes the bakery makes during the day. Though it does kinda tick our manager off when we go strait for the snacks as soon as we sign in XD. i failed cakes class because my chef didn’t like us using bright colors for frosting, or being creative in any way. the curriculum was very nearly straight out of the seventies and everything was fairly unappetizing. Cutting that would be hard. Separating it from the rest of the cake would be much harder. Oh great idea! Let’s watch the fall-out with the Weight-Watchers’ Association…. why does biff need a trainer?….or was it one that he mail ordered like all the rest of the stuff? I see what he did there. Somehow, Biff still looks unsatisified with his ‘small’ slice of cake. . I thought we decided he was an alien in employ by the US government. where else would he get all his wonderful toys? mayhaps i’ve been eating so many sweets this week is because of biff and his dessert cravings. biff has hijacked my subconscious and tells me to eat sweet things i don’t need! Break through the diet plans and kick self-control to the curb! is his eybrow leaning on the windowsill? BIFF. You’re brilliant. 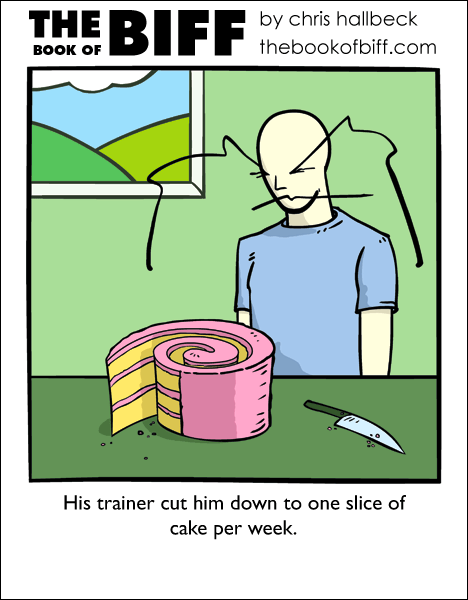 Now I know how to retaliate when my doctor says only once slice of cake a week~ XD … Though, that would be greedy. Perhaps I should just use this brilliance to impress guests on a nice little desert display. Now why didn’t I think of that, thanks for the idea Biff. … That is a very big slice of cake. It could easily spread out a week. I have eaten cake for breakfast before, and I would love a spiral shaped slice.